The team, who was a №6 seed, was the underdog in every playoff game they played. The Panthers celebrate their victory after the final out was recorded. 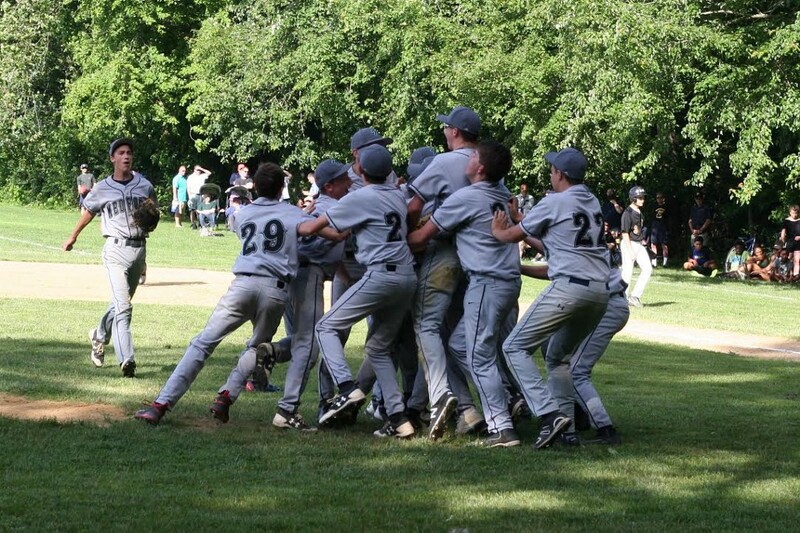 For the first time in 12 years and the second time in 19 years, Medford Memorial Middle School’s baseball team has won the league championship. In the championship game, called the Simon Cup Final, Medford, a №6 seed that went 7–4 during the year, beat №4 seed Moorestown, 6–2. Moorestown’s record was 8–3 during the regular season. Key players included Petey Tronosky who pitched 4 ⅓ innings with six strikeouts and only two earned runs, and Brian Muller who went the final 2 ⅔ innings, with two strikeouts and no earned runs. Muller also played first base and right field throughout the season. Shortstop Luke McGinley went 3–4 at the plate, first baseman Jake Kennealy went 2–3, and Kevin Caldini was noted for an important two-RBI single. Other players whom Fasolo felt deserved special recognition were third baseman Cole Catalano, centerfielder Donovan Dougherty, shortstop/second baseman John Bukofsky, left fielder Luke Wicker, right fielder Kevin Caldini and catcher Branden Petterson. Fasolo also serves as a math teacher at the school. His assistant coach, Joni-Jean Crivello, whom Fasolo credits for much of the team’s success, doubles as a social studies teacher at MMS. To get to the finals, Medford had to beat №3 seed Rosa International Middle School, which went 9–2 during the regular season, in the first round and then №2 seed Glen Landing, which went 10–1 during the regular season, in the next round. As a result, Medford was the underdog in every playoff game it played and played every playoff game on the road. Interestingly, there was a 15-day gap between the quarterfinal game against Rosa and the semi-final game against Glen Landing due to bad weather. Glen Landing’s field had drainage issues, so the teams had to wait several days for the field to dry after a rainstorm, leading to an extended period of time between games. There are 16 teams in the league and only eight make the playoffs. Medford got off to a rough start at the beginning of the year, going 1–2 in its first three games. Fasolo says aggressive base running was a big reason behind the team’s success. Marlton’s regular season record ended up at 10–1, earning it the top seed in the playoffs. The team’s lone loss came from Medford. Marlton lost in the semi-final round to Moorestown. As a result, when Medford beat Moorestown in the finals, Medford was playing a team that had just taken down the №1 seed. Not only were the kids great baseball players, they were great people. In addition to thanking Crivello, Fasolo also wanted to thank Superintendent Joseph Del Rossi, the district’s Board of Education and the school’s principals Shawn Ryan, Peter Bisconte and Brooke Farrow. He also wanted to thank the parents for putting up with various schedule changes throughout the season. From a personal standpoint Coach Fasolo would like to thank his girlfriend Trina Ferringo and their three children Luke, 14, Stephen, 13, and Angelina, 11 for their personal sacrifices that they had made to make this season a huge success. Coach Fasolo would also like to thank his father Dominic for teaching him all about the wonderful game of baseball.